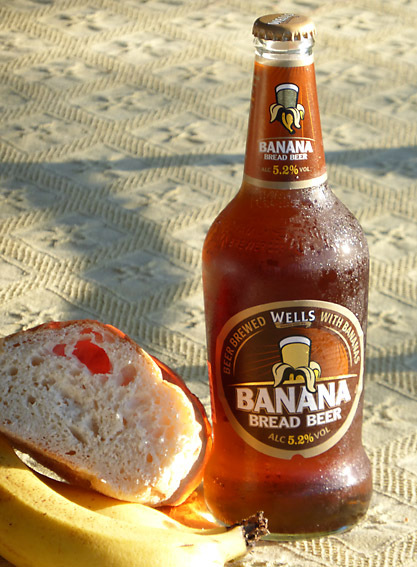 ‘Banana Bread Beer’ sounds like one of my shopping lists when I was a student. I’d always thought of ‘flavoured’ beers as a bit gimmicky but as the saying goes, ”Don’t knock till you’ve tried it’. Wells and Young’s Brewery have a long brewing tradition and some very fine ales in their armoury so I was willing to give it a go. A rich toffee in colour, it smells like the breath of a baby elephant I once met in Kanchanaburi, i.e bananas. It’s not as sweet as it smells though. The neck label tells us the ‘long ago, ale used to be known as “liquid bread’, but there’s not one hint of Hovis or Mother’s Pride on the tongue. In fact it tastes like a banana milkshake made with beer …. a beershake! Whole foods like this are quite a revelation and in theory could provide 3 of your 5-a-day. Banana Bread Beer is made with real, fair-trade bananas and by drinking it you’ll be helping to make the world a better place. It’s also made with real beer, so the world will feel like a better place any way.